I am curious. I take it that you feel the DOW may double into 2015. Yet the SPX looks like it may roll over and crash. Does what you say about the DJIA equate equally with the S&P 500, or are they going to diverge and one goes up, while the other crashes? ANSWER: Do not confuse long-term and short-term. The market was due for a correction and that may continue into September. The depth of the decline is important. That will determine what we get into 2015.75. The Dow has the possibility to double into that target. However, to see that, we have to see capital concentrate in the US both from Europe and Asia. Capital is pouring out of the emerging markets. Brazil, India, and China that looked so good are now moving opposite. The Bail-In policy in Europe could send a massive tidal Wave of capital into US equities because you cannot trust the banks. If that happens, the Fed will raise interest rates attracting more capital to the dollar and the bonds crash with the budget deficit rising. That will set the tone for a dramatic expansion in debt and that is the catalyst for the Sovereign Debt Crisis. 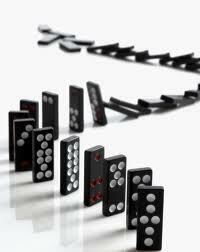 This is a game of dominoes. One is necessary to push the over the next one. Those talking about hyperinflation are missing the point that with taxes rising, low interest rates and the deficit declining, where is this wave of massive spending coming from? We need to send the system into its debt spiral for as that happens then the unfunded liability will get bigger. This is a fire burning. It needs some more fuel. Then you will see the commodity rally. But right now, the decline in commodity prices shuts down supply. That is necessary to create the next rally – it is called shortage.